Mercedes-Benz announced details about its all-new Mercedes SLK Roadster 2012. The new roadster takes driving pleasure and open-air enjoyment to a new level. It blends light-footed sportiness with stylish comfort, a striking sports-car design with total suitability for everyday use and top performance with exemplary ecology. What’s more, the SLK is proud to present the world premiere of the panoramic vario-roof with Magic Sky Control, which switches to light or dark at the touch of a button. Stuttgart – With the completely new developed SLK, one of the most exciting and successful sports cars ever built is entering its third generation. The new roadster takes driving pleasure and open-air enjoyment to a new level. It blends light-footed sportiness with stylish comfort, a striking sports-car design with total suitability for everyday use and top performance with exemplary ecology. What’s more, the SLK is proud to present the world premiere of the panoramic vario-roof with Magic Sky Control, which switches to light or dark at the touch of a button. Exemplary efficiency and sporty flair come courtesy of powerful new 4- and 6-cylinder engines featuring the standard-specification ECO start/stop function. With their superb levels of performance they are up to 25 per cent more economical than their predecessors. A unique set of safety equipment bestows role-model status on the SLK in this segment. With its wealth of technical innovations the SLK is once again the benchmark in its class. But the new Mercedes-Benz SLK offers more than merely individual highlights. It assumes a leading position in every discipline and offers fun at the wheel in every respect, with no half-hearted compromises. It impresses with characteristics which are generally deemed to be irreconcilable: it succeeds in uniting excellent comfort and high-quality equipment and appointments with a decidedly sporty flair. At the same time the new roadster is one of the most economical and environmentally friendly in its class and sets new safety standards. All-weather driving enjoyment – with the roof open and closed, in leisure-time and everyday use – is firmly anchored in the SLK’s genes. The designers have tailor-made a body for the new SLK which emphasises its classic roadster proportions and puts them in the spotlight to thrilling effect. Behind the long bonnet is a compact passenger compartment positioned far back, and a short tail end. The SLK will tempt potential customers with the key attributes that characterise all the classic roadsters from Mercedes-Benz and that have also made many of them automotive icons of the brand. The first feature to catch the eye is an upright radiator grille that stands proud and confident in the wind and bears the new Mercedes-Benz brand look. It facilitates the long and well-proportioned bonnet and with its rearward light-catching contours it already hints at the roadster’s dynamic qualities. The wide radiator grille bears the Mercedes-Benz star in a prominent central position and displays a powerfully contoured, chromed fin at the front. The clearly defined headlamps complete the look for the new SLK’s face, which resembles that of the legendary 190 SL from the 1950s, which is regarded by many as being the original “SLK”. But it was certainly not just the past that the designers were focusing on; with the new SLK’s front end they also intentionally created a close visual link with the new Mercedes-Benz SLS AMG “gullwing model” and the new CLS. The amazing and measurable proof of the meticulously detailed work that has been carried out is that in spite of the more striking, steeper front and the larger frontal area, the Cd value has been cut to just 0.30 – a brilliant achievement (the predecessor model’s Cd value was 0.32). The timelessly classic shape of the side view with the classic roadster proportions embodies aesthetics of the highest calibre and is a visual promise of the sportiness and driving pleasure in store. Fine details and quotes show the care that has been taken by the Mercedes-Benz designers. For example, a fillet conceals the boot joint, so that the side line cannot get in the way, as it usually does with similar roof designs. The ventilation grilles in the front wings with a chromed fin are reminiscent of the famous Mercedes-Benz roadsters of the 1950s. In the new SLK they form the perfect starting point for a feature line which flows to the muscular rear wing, using light and shadow to add style and timeless aesthetics to the sides. Meanwhile the upper edge of the wide headlamps – which boast all-LED technology for the first time – also appears to flow into the feature line. With the most compact dimensions in its class, the new SLK has an interior whose generous size is exemplary. To achieve this, the designers have developed interior appointments which offer the driver and passenger the highest degree of perfect perceived quality and puristic precision. The interior is characterised by stylish sportiness and high-quality, authentic materials which have been processed with perfect precision and skilled craftsmanship. The centre console and other trim parts gleam in brushed aluminium. Wood can be selected as an option in high-gloss dark brown walnut or high-gloss black ash. Four round, galvanised air outlets integrated in the dashboard emphasise that this model well and truly belongs to the Mercedes-Benz sports car family, their shape being a nod to those in the SLS. The SLK’s generous round dials are flanked by the information display for the online computer. The colour display for the communications and entertainment functions is housed in the centre of the dashboard, and can be easily read by both the driver and passenger. On the top of the dashboard, also in the centre, sits a fine analogue clock – an unusual detail which subtly underlines the roadster’s stylish character. Other high-quality items of equipment include a multifunction sports steering wheel with a flattened bottom section and a thick leather crown, plus optional sun-reflecting leather which noticeably reduces the degree to which the surfaces it covers heat up, impressive ambient lighting and the innovative neck-level heating system Airscarf, familiar from the predecessor. A comfortable alternative to the conventional draught-stop is a new pivoting draught-stop for the SLK which has been invented by Mercedes-Benz aerodynamics engineers. It consists of pivoting transparent plastic layers which are attached to the reverse of the roll-over bars. The driver or passenger can swing them to the centre of the vehicle in a flash, thus taming turbulent air flow. There will initially be three models of the SLK available at its market launch, all of them powered by new engines with direct injection. The four-cylinder engines in the SLK 200 BlueEFFICIENCY and SLK 250 BlueEFFICIENCY develop 184 hp and 204 hp respectively from a displacement of 1796 cubic centimetres. The SLK 200 BlueEFFICIENCY is the most economical roadster in its segment. With the enhanced, optional seven-speed automatic transmission 7G‑Tronic Plus it returns 46.3 mpg on the combined cycle. The frugal model sprints from 0 to 62 mph in 7.0 seconds, and achieves its top speed at 147 mph (150 with manual transmission). 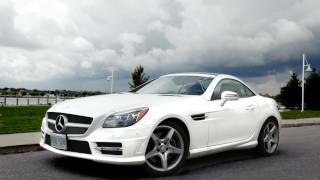 The SLK 250 BlueEFFICIENCY is equipped as standard with the 7G-Tronic Plus automatic transmission and returns 45.5 mpg on the combined cycle. From a standstill it reaches 62 mph in 6.6 seconds, and it has a top speed of 150 mph. The V6 engine in the SLK 350 BlueEFFICIENCY draws 306 hp from its 3498 cubic-centimetre displacement, using this power to accelerate in 5.6 seconds from 0 to 62 mph (top speed 155 mph). It returns 39.7 mpg on the combined cycle. The new V6 engine has been developed from the ground up and its most important hallmarks are its 3rd-generation direct injection, piezo injectors and multi-spark ignition. The exemplary efficiency, with fuel consumption improved by up to a quarter compared with the predecessor models, is also due to the ECO start/stop system which is fitted as part of the standard specification in all models. Also included in the Dynamic Handling package are a Direct-Steer system and the Torque Vectoring Brakes developed by Mercedes-Benz. The Direct-Steer system offers more handling and agility than the standard steering, whilst also reducing the amount of physical effort required when parking. In critical conditions the Torque Vectoring Brakes produce a defined rotational movement of the vehicle about the vertical axis in fractions of seconds through selective brake actuation at the rear wheel on the inside of the bend. This results in the SLK stabilising without any compromises where dynamism is concerned, and it steers into the bend precisely and under full control. The new SLK’s bodyshell structure has been further refined, with the bonnet and wings now made of aluminium. The new Mercedes-Benz SLK also sets new benchmarks in terms of safety. The third generation of the powerful trend-setter will make use of a whole host of the latest assistance systems to support the driver, including the drowsiness detection system ATTENTION ASSIST, developed by Mercedes-Benz and the anticipatory occupant protection system Pre-Safe® , which is unique in the world, both fitted as standard; plus the optional Pre-Safe® Brake, which can apply the brakes autonomously in the event of an impending rear-end collision. As such, with the SLK, Mercedes-Benz is consistently and significantly exceeding the requirements imposed by safety standards. The new SLK will launch in the UK in June, 2011. Pricing and UK specifications are still to be confirmed.